Four wheels permit the entire load to rest on the wheels -- just push the load anywhere. 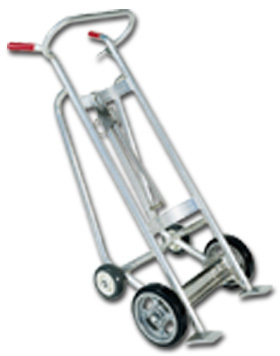 Perfect for palletizing drums -- rear wheels act as a pivot to raise drums onto skids. Rugged 1-5/16" O.D. aluminum tubing frame or 1-1/8" O.D. 14 ga. steel tubing handles loads of up to 1000 lbs. Rolls smoothly on a large 10 x 2-1/2" solid rubber tires. Spring loaded chime hook automatically engages the drum rim -- drum can't fall away from truck. Chime hooks available for Standard Steel Drums, Fiber Drums or Locking Cover Drums - please specify. Handles either 30 or 55 gal. drums. FOB Shipping Point. Here's a way to control the load down ramps or curbs... hand lever operated brakes let you keep total control. Product No. Cap. (lbs.) Wt. (lbs.) Price Ea.